With CES taking place this week a number of mobile announcements are in the pipeline. And in what has become something of a tradition for Imagination Technologies, they are using the backdrop of CES to make their annual PowerVR product announcements. The big news out of Imagination this year is that PowerVR Series6 will be getting a refresh, with the company announcing the existence of their new Series 6XT architecture and that it’s immediately available for licensing. Series6XT is designed to be a moderate feature upgrade and power/performance optimization pass for Series6, integrating various innovations over the past couple of years to keep Imagination’s designs performance and feature competitive. Series6XT comes 2 years after Series6 licensing was announced at CES 2012, and roughly half a year after the first SoCs implementing Series6 GPUs were released to consumers. So what’s new in Series6? Although Imagination does like to keep to high level details in their CES announcements, nothing out of the Series6XT announcement makes it sound like we’re looking at a significant overhaul of the Series6 architecture. Which means it’s safe to assume that we’re still looking at Imagination maintaining their Unified Shading Cluster (USC) design, a 16-wide scalar SIMD with each slot capable of up to 4 FP32 ops per clock. Other aspects of the design have been changed – various other functional blocks have been updated with new features to improve performance – but the fundamental architecture and execution model would appear to remain unchanged. Similarly, this means that API support also remains unchanged, with OpenGL ES 3.0 remaining as the baseline for all Series6XT parts. Though it’s not immediately clear whether any of these specific designs are available in a Direct3D 11_1 configuration too. Taking a look at what changes have been made, Series6XT will be gaining finer grained power gating through what Imagination is calling “PowerGearing G6XT” technology. Mobile class GPUs have featured power gating for some time – it being necessary in order to achieve the low power consumption today’s mobile devices shoot for at idle and in light workloads – with higher grained solutions offering even more efficiency gains by being able to shut off a larger percentage of the GPU when those resources aren’t required. 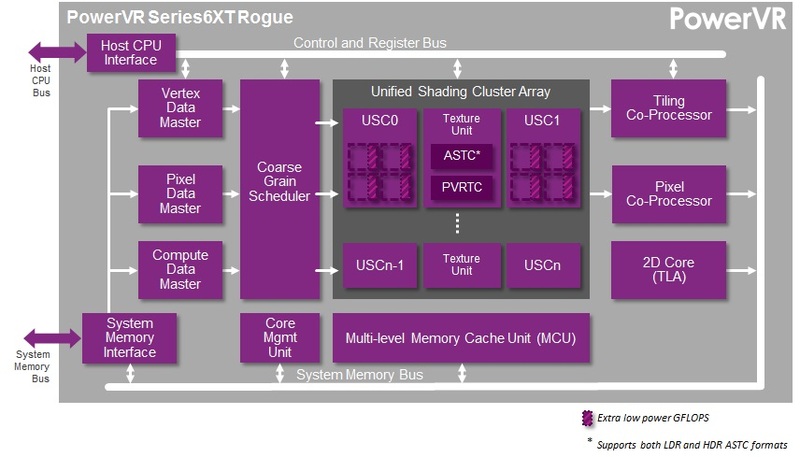 For Series6XT, Imagination gains the ability to shut off individual USCs and other processing blocks within their GPUs, which should be especially beneficial in light workloads where the GPU can’t idle, but it doesn’t need to allocate all of its resources either. Meanwhile when it comes to performance Imagination has made several improvements and optimizations for Series6XT, with Imagination claiming performance gains of up to 50% versus Series6. Among other things, Imagination has specifically targeted front end and back end performance on Series6XT, nothing that they’ve made changes to improve sustained polygon and pixel fillrate performance. Though it’s not clear whether these are simply optimizations of their existing hardware or if those blocks have been outright widened for greater throughput. Elsewhere Series6XT also includes a new iteration of Imagination’s Hierarchical Scheduling Technology (HST) to further improve resource utilization, along with performance optimizations that draw from instruction set streamlining and some compute-specific data path optimizations. Of course none of this takes into account clockspeeds either; while Imagination’s designs are intended to cover a range of clockspeeds based on power/performance requirements, it’s a safe bet that Series6XT is designed to clock higher than Series6, as GPU and CPU clockspeeds have ratcheted up over the years. Series6XT’s final set of new features comes through what Imagination is calling “PVR3C”, which is a catch-all name for all of the various compression technologies that Series6XT supports. New to Series6XT is support for Adaptive Scalable Texture Compression (ASTC), a variable block size texture compression algorithm being blessed and promoted by Khronos as the next generation of texture compression for both mobile and desktop devices. ASTC is designed to improve texture compression efficiency both by improving the quality attainable at any compression ratio while allowing the use of larger blocks to further reduce the data size of textures, going up to a 36:1 ratio at a block size of 12x12. 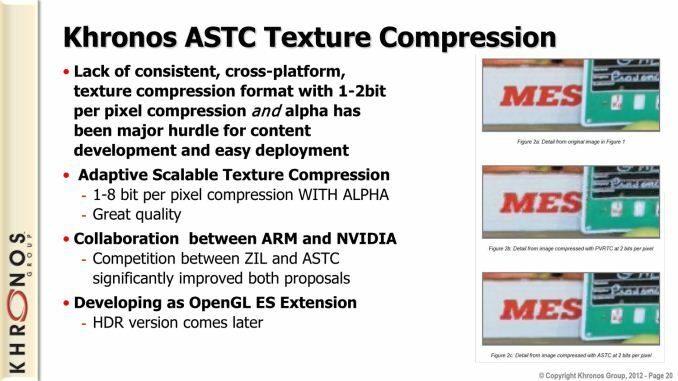 Though ASTC has yet to make it into the OpenGL ES core standard - it was finalized and ratified as an extension after OpenGL ES was approved - we wouldn't be surprised to see ASTC as a part of the OpenGL ES core standard by the time Series6XT hardware begins shipping. ASTC joins the other texture compression formats that the previous Series6 designs supported, including the PVRTC series and ETC. Texture compression aside, Series6XT also includes updates for Imagination's lossless image compression technology. PVRIC, first introduced on the Series6 6x30 parts, is now up to PVRIC2, offering further improvements to compression throughput and performance. 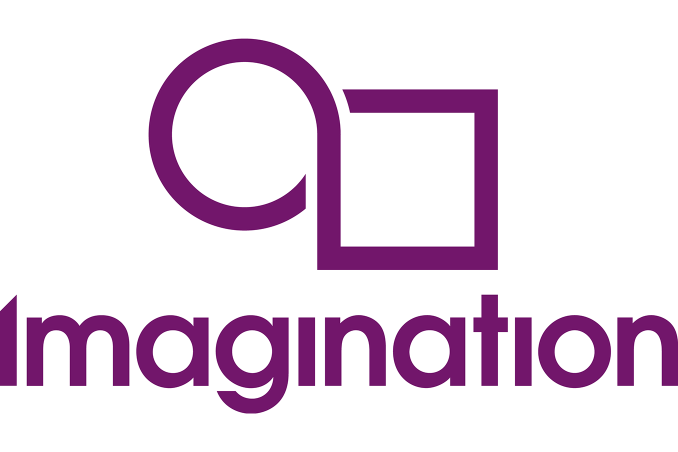 Rounding out the PVR3C collection is Imagination’s lossless geometry compression technology, PVRGC, which has actually been in the architecture since Series6, but until now has never had a formal name nor has it been widely discussed by Imagination. 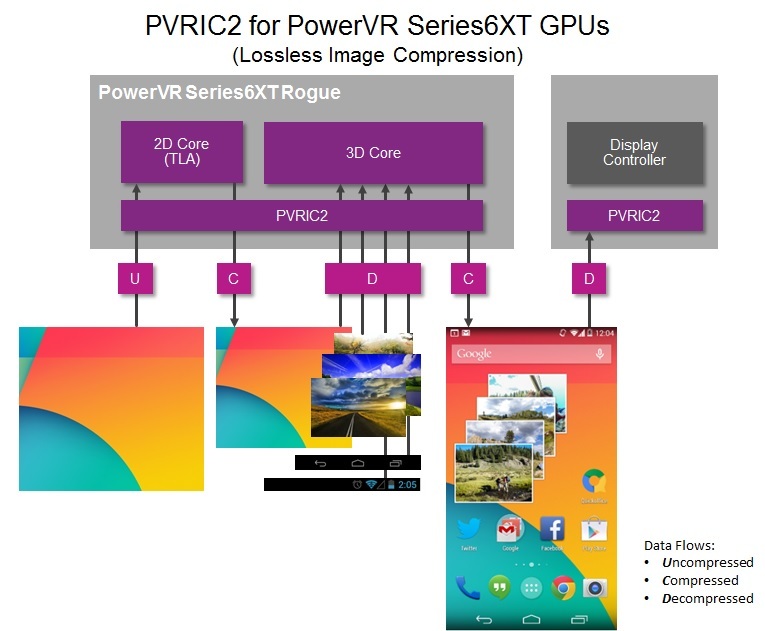 PVRGC is an in-flight (intermediate) geometry compression technology, intended to reduce the amount of bandwidth needed to shuffle geometry within the GPU and between the GPU and its external RAM, with an average compression ratio of 3:2. Wrapping things up, as Imagination is announcing that Series6XT is available for immediate licensing, we already have some information on the GPU designs being released. Series6XT parts will be under the GX prefix, with the GX6240, GX6250, GX6450, and GX6650 designs being released today. As alluded to by the part numbers, GX6240 and GX6250 are two cluster parts, while GX6450 is a four cluster part and GX6650 is a six cluster part. Furthermore of those parts, GX6240 is an area optimized part, while the rest are performance optimized. With Series6XT focusing so much on performance and optimization improvements, although it’s not stated as such, for area efficiency in higher performance designs Imagination appears to be pushing customers towards smaller Series6XT designs, rather than having slower versions of larger designs. It’s worth noting that Imagination’s earlier Series6 designs also topped out at six clusters with G6630, so while Imagination is scaling up performance internally, we’re not seeing them go with outright wider GPUs for the Series6XT family (at least not yet). So Series6XT’s performance improvements will come from these internal changes, including performance optimizations and any wider blocks within. Finally, while Imagination doesn’t provide a timeframe for consumer availability (since they only sell designs to chipmakers), based on the amount of time needed to integrate these designs into new products and then get those products in the hands of consumers, we should be looking at a timetable similar to the original Series6 designs. In which case Series6XT equipped SoCs would start appearing in 2015, likely in the latter half. Without clockspeeds it's extremely hard to say. From a high level a 6 cluster Series6XT configuration offers the same number of FLOPS per clock, but this doesn't take into account real world efficiency either. While peak FP32 performance is similar for Series6 and Series6XT, we've made a number of performance optimizations and added some clever architectural improvements (turning parts of the design - including clusters - on/off, better resource utilization, updated rasterizer, improved GPU compute paths, etc.) which offer better low power performance. This is essential for mobile; matching user experience to theoretical peak performance works reasonably well for desktop PCs and consoles, mobile designs are a whole different affair and any mobile design should be judged based on performance efficiency (getting the best performance possible in a limited power envelope). I am going to say K1. Very impressive indeed to have that fitted into Mobile. And "if" Series6XT is only coming out in 2015, then it will be going against Maxwell, judging from Nvidia pass record, i would bet Maxwell will be super impressive. And Since Nvidia is now licensing their Kelper design as well. I wonder if there are any one will to take it. It will be a very powerful thing to have the same GPU in PC, and Mobile. But Performance is only one thing, power efficiency at low usage level is also important, and we have yet to see how Kelper do in that regards. ASTC is one of the most exciting thing that has happened to Android, and it's great that seemingly all major players (except NVidia) will be supporting the standard in their upcoming GPUs. This along with a more feature-full and more strictly defined OpenGLES 3.0 should make cross platform development MUCH easier when targeting the Android platform (no need to fork art assets). Hopefully Android Runtime (ie. ART) integration also improves the performance of Android's native Java code (it compiles the bytecode it at install time to a native executable), which would further ensure write-once run-anywhere across the platform. Together with Renderscript, there is a really comprehensive architecture-agnostic framework for development. This is great news for Android game developers.